Web based project management software ZilicusPM enables project managers to design and offer different levels of visibility to project stakeholders. Project stakeholders can be project owner, creator, portfolio manager, executive management, team members, customers, vendors, auditor, etc. In absence of right project management system, stakeholders do not get to see same project information. ZilicusPM provides the right access to right stakeholder at a right time. Thus making it more transparent, accessible, actionable and more accountable for stakeholders to get involved and deliver project successfully. Each project stakeholder has different expectations from a given project. It is not uncommon to see that Project managers struggle to understand stakeholder’s expectations. The problem gets compounded when project stakeholder gets different picture of project at different time based on information shared by project manager. Stakeholder’s also see project from their own perspective and derives his/her impression of project progress, responsibility and accountability from what s/he can view and what s/he is informed about. If project manager is manually going to update stakeholders like team members, sponsors, customers, auditor about project information, there are very high chances that project manager may miss out on keeping them updated or miss out on the information s/he should have shared. It is important for success of a project that stakeholders should see same project information, of course filtered according to their level of involvement and decision making. One can just imagine what would happen if the projects are long duration ones and fairly complex. Everyone would keep on guessing about state of project, their responsibility of delivering project and it will mark the path for project failure. Fortunately project managers use the right web based project management software to manage project complexity as well as access to project information to its stakeholders. Web Based Project Management Tool ZilicusPM offers clear and distinct visibility different stakeholder’s depending on their roles. Project team members may not be concerned about overall Gantt chart or project cost; however they should be particular about their own tasks. ZilicusPM shows exactly those things that team members should be working on. 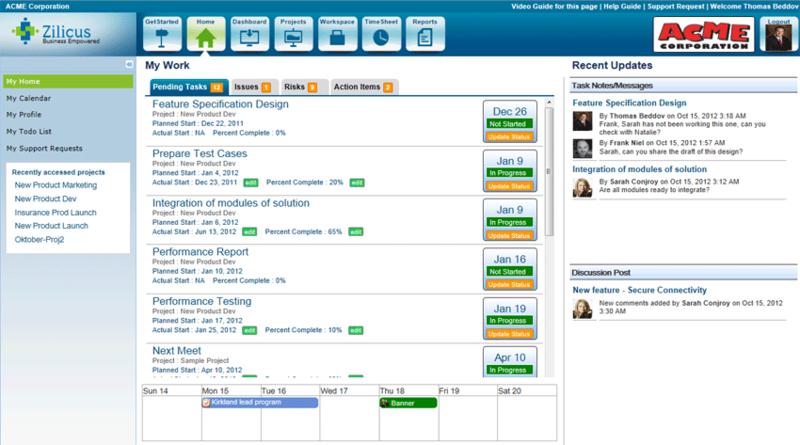 ZilicusPM shows pending tasks, issues, risks, meeting action items on home screen, even it has a distinct task schedule page exclusively for individual team member, issues, risks report that shows issues and risk applicable to a given individual. In short ZilicusPM keeps team members on top of their activities, so that they won’t miss out and neither they will be overwhelmed with all available information. Project manager is the prime mover of the project. He has maximum visibility into the project, he can control project schedule, issues, risks, meeting, budget, cost, biling like financial information. Using ZilicusPM project management system, project manager can control access to other stakeholders, to get them more involved in terms of project activities. ZilicusPM offers project dashboard & reports for project manager and it also has the ability to remind team members about task progress, issues, risks enables project manager to proactively manage project. Portfolio manager has multiple projects to look after. ZilicusPM provides portfolio level dashboard, reports for portfolio owners to clearly know the status of different projects in his portfolio. 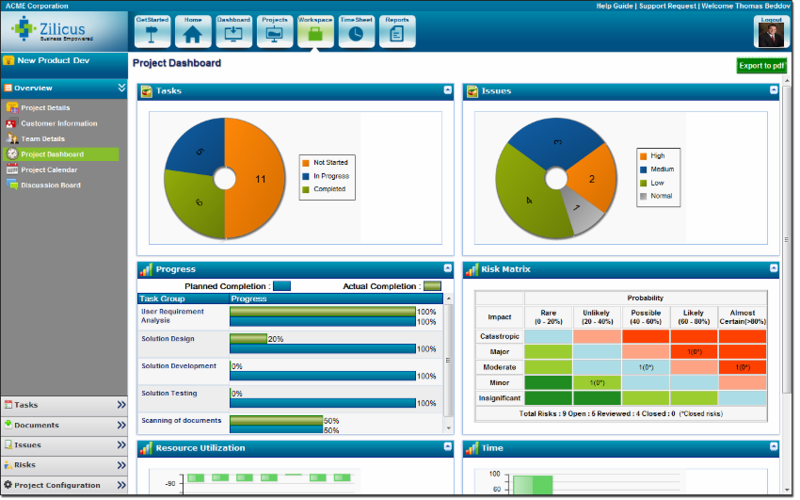 ZilicusPM is a robust portfolio project management software for portfolio managers in enterprise organizations. It enables portfolio managers to set up portfolio, set budget, track progress of projects in a given portfolio using a distinct portfolio screen. Portfolio managers can check status & progress of projects using interactive portfolio dashboard, using which they can drill down to exact problem in a given project that could be causing bottleneck. Project customers are the most important stakeholder of the project. Customers are the one who decides the business value of the delivered project. So as one can imagine, project customers should not be surprised negatively when the project is delivered to them. Web based project management tool is expected to provide transparency and ability for customers to get engaged with project through its lifecycle. 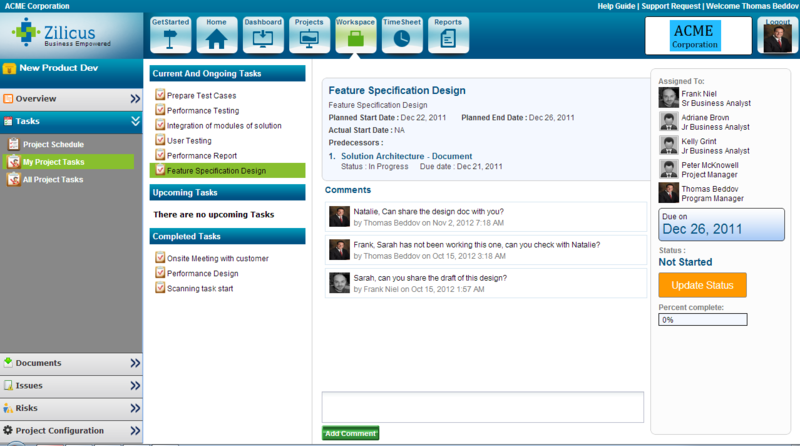 ZilicusPM is great enabler for client collaboration. It allows project managers to involve project customers and it also enables project manager to define access level according to project’s requirement. Thus project customers can work with project team, project manager, collaborate with them, get access to latest status of project and in turn they can contribute in making the project deliverable useful to them. There are other stakeholders who get involved from time to time, during the project delivery lifecycle. These stakeholders can be project sponsors, project auditors, internal customers, government agencies, partners, etc. ZilicusPM allows project managers to define who are stakeholders of the project and enable them to collaborate with project team for various reasons like audit, compliance requirements, deciding financial status of project, seeking feedback, etc.